Poyurovsky, Michael and Weizman, Abraham 2015. Treatment of Antipsychotic-Related Akathisia Revisited. Journal of Clinical Psychopharmacology, Vol. 35, Issue. 6, p. 711. Jethwa, Ketan Dipak 2015. Pharmacological management of antipsychotic-induced akathisia: an update and treatment algorithm. BJPsych Advances, Vol. 21, Issue. 5, p. 342. Praharaj, Samir Kumar Kongasseri, Sreejayan Behere, Rishikesh V. and Sharma, Podila Satya Venkata Narasimha 2015. Mirtazapine for antipsychotic-induced acute akathisia: a systematic review and meta-analysis of randomized placebo-controlled trials. Therapeutic Advances in Psychopharmacology, Vol. 5, Issue. 5, p. 307. Sethuram, Karthik and Gedzior, Joanna 2014. Akathisia: Case Presentation and Review of Newer Treatment Agents. Psychiatric Annals, Vol. 44, Issue. 8, p. 391. Poyurovsky, Michael Bergman, Josef Pashinian, Artashez and Weizman, Abraham 2014. Beneficial effect of low-dose mirtazapine in acute aripiprazole-induced akathisia. International Clinical Psychopharmacology, Vol. 29, Issue. 5, p. 296. Chen, Mu-Hong and Liou, Ying-Jay 2013. Aripiprazole-Associated Acute Dystonia, Akathisia, and Parkinsonism in a Patient With Bipolar I Disorder. Journal of Clinical Psychopharmacology, Vol. 33, Issue. 2, p. 269. Ribosa-Nogué, Roser Pagonabarraga, Javier and Kulisevsky, Jaime 2012. Efficacy of trazodone in antipsychotic-induced akathisia resistant to conventional treatment. Parkinsonism & Related Disorders, Vol. 18, Issue. 7, p. 902. Fahn, Stanley Jankovic, Joseph and Hallett, Mark 2011. Principles and Practice of Movement Disorders. p. 415. Advokat, Claire 2010. A Brief Overview of Iatrogenic Akathisia. Clinical Schizophrenia & Related Psychoses, Vol. 3, Issue. 4, p. 226. Poyurovsky, Michael 2010. Acute antipsychotic-induced akathisia revisited. British Journal of Psychiatry, Vol. 196, Issue. 02, p. 89. Stryjer, Rafael Rosenzcwaig, Silvio Bar, Faina Ulman, Ann Marie Weizman, Abraham and Spivak, Baruch 2010. Trazodone for the Treatment of Neuroleptic-Induced Acute Akathisia. Clinical Neuropharmacology, Vol. 33, Issue. 5, p. 219. Hieber, Robin Dellenbaugh, Timothy and Nelson, Leigh Anne 2008. Role of Mirtazapine in the Treatment of Antipsychotic-Induced Akathisia. Annals of Pharmacotherapy, Vol. 42, Issue. 6, p. 841. Goudie, Andrew J. Cooper, Gillian D. Cole, Jon C. and Sumnall, Harry R. 2007. Cyproheptadine resembles clozapine in vivo following both acute and chronic administration in rats. Journal of Psychopharmacology, Vol. 21, Issue. 2, p. 179. 2006. Atlas of Psychiatric Pharmacotherapy, Second Edition. p. 147. Braude, Darren and Boling, Sandy 2006. Case report of unrecognized akathisia resulting in an emergency landing and RSI during air medical transport. Air Medical Journal, Vol. 25, Issue. 2, p. 85. Ranjan, Sanjeev Chandra, Prabha S Chaturvedi, Santosh K Prabhu, Santosh C and Gupta, Arun 2006. Atypical Antipsychotic–Induced Akathisia with Depression: Therapeutic Role of Mirtazapine. Annals of Pharmacotherapy, Vol. 40, Issue. 4, p. 771. Poyurovsky, Michael Pashinian, Artashes Weizman, Ronit Fuchs, Camil and Weizman, Abraham 2006. Low-Dose Mirtazapine: A New Option in the Treatment of Antipsychotic-Induced Akathisia. A Randomized, Double-Blind, Placebo- and Propranolol-Controlled Trial. Biological Psychiatry, Vol. 59, Issue. 11, p. 1071. Miodownik, Chanoch Lerner, Vladimir Statsenko, Nikolay Dwolatzky, Tzvi Nemets, Boris Berzak, Elina and Bergman, Joseph 2006. Vitamin B6 Versus Mianserin and Placebo in Acute Neuroleptic-induced Akathisia. Clinical Neuropharmacology, Vol. 29, Issue. 2, p. 68. Adler, L. A., Angrist, B., Retter, S., et al (1989) Neuroleptic-induced akathisia: a review. Psychopharmacology, 97, 1–11. Barnes, T. R. E. (1989) A rating scale for drug-induced akathisia. British Journal of Psychiatry, 154, 672–676. Barnes, T. R. E. & McPhillips, M. A. (1999) Critical analysis and comparison of the side-effect and safety profiles of the new antipsychotics. British Journal of Psychiatry, 174 (suppl. 38), 34–43. D'Mello, D. A., McNeil, J. A. & Harris, W. (1989) Buspirone suppression of neuroleptic-induced akathisia: multiple case reports (letter). Journal of Clinical Psychopharmacology, 9, 151–152. Fischel, T., Hermesh, H., Alzenberg, D., et al (2001) Cyproheptadine vs. propranolol for the treatment of acute neuroleptic-induced akathisia: A comparative double-blind study. Journal of Clinical Psychopharmacology, in press. Fleischhacker, W. W., Roth, S. D. & Kane, J. M. (1990) The pharmacologic treatment of neuroleptic-induced akathisia. Journal of Clinical Psychopharmacology, 10, 12–21. Kapur, S. & Remington, G. (1996) Serotonin – dopamine interaction and its relevance to schizophrenia. American Journal of Psychiatry, 153, 466–476. Lane, R. M. (1998) SSRI-induced extrapyramidal side-effects and akathisia: implications for treatment. Journal of Psychopharmacology, 12, 192–214. Leysen, J. E., Gommeren, W. & Shotte, A. (1996) Serotonin receptor subtypes: possible roles and applications in antipsychotic drug action. In Serotonin in Antipsychotic Treatment. Mechanisms and Clinical Practice (eds Kane, J. M., Moller, H.-J. & Awouters, F.), pp. 51–75. New York: Marcel Dekker. Meltzer, H. Y. (1999) The role of serotonin in antipsychotic drug action. Neuropsychopharmacology, 21 (suppl. 2), 106S–115S. Miller, G. H., Fleischhacker, W. W., Ehrman, H., et al (1990) Treatment of neuroleptic-induced akathisia with the 5-HT2 antagonist ritanserin. Psychopharmacology Bulletin, 26, 373–376. Miller, C. H., Hummer, M., Pycha, R., et al (1992) The effect of ritanserin on treatment-resistant neuroleptic-induced akathisia: case reports. Progress in Neuropsychopharmacology and Biological Psychiatry, 16, 247–251. Poyurovsky, M. & Weizman, A. (1997) Serotonergic agents in the treatment of acute neuroleptic-induced akathisia: open-label study of buspirone and mianserin. International Clinical Psychopharmacology, 12, 263–268. Poyurovsky, M. & Weizman, A. (1999) Lack of efficacy of the 5-HT3 receptor antagonist granisetron in the treatment of acute neuroleptic-induced akathisia. International Clinical Psychopharmacology, 14, 357–360. Poyurovsky, M. & Weizman, A. (2001) Low dose mirtazapine ameliorates acute neuroleptic-induced akathisia (letter). American Journal of Psychiatry, in press. Poyurovsky, M., Fuchs, C. & Weizman, A. (1998) Low-dose mianserin in the treatment of acute neuroleptic-induced akathisia. Journal of Clinical Psychopharmacology, 18, 253–254. Poyurovsky, M., Shardorodsky, M., Fuchs, C., et al (1999) Treatment of neuroleptic-induced akathisia with the 5-HT2 antagonist mianserin. Double-blind, placebo-controlled study. British Journal of Psychiatry, 174, 238–242. Richelson, E. (1996) Preclinical pharmacology of neuroleptics; focus on new generation compounds. Journal of Clinical Psychiatry, 57 (suppl. 11), 4–10. Seeman, P. & Tallerico, T. (1998) Antipsychotic drugs which elicit little or no parkinsonism bind more loosely than dopamine to brain D2 receptors yet occupy high levels of these receptors. Molecular Psychiatry, 3, 123–134. 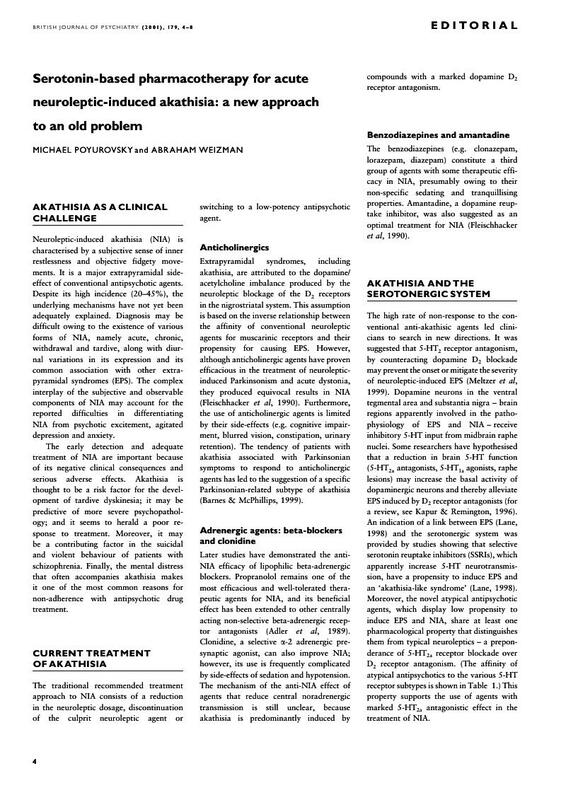 Weiss, D., Aizenberg, D., Hermesh, H., et al (1995) Cyproheptadine treatment in neuroleptic-induced akathisia. British Journal of Psychiatry, 167, 483–486.